Where do I use my Traffic People voucher code? Traffic People was devised out of a love for vintage-inspired fashion and beautifully dressed women of the past like Lauren Bacall, Anita Pallenburg, Ava Gardiner and Bianca Jagger. Traffic People’s design ethos is to encompass the latest fashion trends in a contemporary style with a vintage, edgy feel with the use of beautiful and unique prints and details. 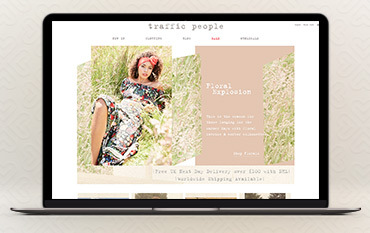 Shop for dresses, jumpsuits, jackets, floral pieces, tops, skirts and trousers as well as new products straight from the Traffic People warehouse. In recent years Traffic People have begun to supply their pieces to a selective range of independent boutique stores throughout Britain, and a network of carefully selected shops throughout Europe like ASOS, Silkfred, Showroom.de and Lux-Fix. Traffic People also provide a wholesale section on their website where you can buy in bulk for your store as well as a great sale section where you can find heavily discounted pieces. If you're after a luxe on-trend wardrobe update for a fraction of the RRP prices then look no further than the Traffic People sale collection. Get your fashion fix with a lust-worthy mix of everything from dresses to shoes to jumpsuits and fill your wardrobe with on-trend pieces from a great independent British retailer. None of Traffic People’s fashion is mass produced so every time you purchase something you can rest assured that it’s unique and of the highest quality, and if it’s in the sale it’ll be extremely affordable too. Discover savings on all kinds of fashion trends including sparkles and checks and save up to 50% on your new must-have fashion pieces. For fashion inspiration and advice take a look at Traffic People’s blog section. Here you can find articles and guides on all things fashion with pieces on ‘how to turn heads at your Christmas party’, ‘how to stay toasty in autumn’, ‘how to wear the next must-have midi dress’ and much, much more. Discover new articles regularly and keep up to date and in the know on the latest trends, styles and lengths. Stay posted on new lines at Traffic People and be the first to know when a new collection drops so you can get your hands on limited edition styles before anyone else. To be notified when new pieces drop you can also sign up to the newsletter where you can discover great discounts too. How can I contact Traffic People? Standard delivery for all UK mainland orders is free. For more delivery information please click here. What is Traffic People’s return policy? You have 14 days to return an item to Traffic People. Traffic People was born in the heart of London on the Portobello Road and Camden in 2002, looking to bring a contemporary twist to unique vintage pieces. Traffic People take influence from the multiple eras between the 1920s all the way up to the 1970s, to bring you everything from cute wiggle dresses to glamorous disco inspired garments. Shop for a range of stylish women’s clothing all of which are completely unique and produced in small amounts making your wardrobe exclusive and more individual to you. Shop online for beautiful pieces and ensure you use a Traffic People discount code from us to save money on your order.